"These passages suggest that the Form is a character or set of characters common to a number of things, i.e. the feature in reality which corresponds to a general word. But Plato also uses language which suggests not only that the forms exist separately (χωριστά ) from all the particulars, but also that each form is a peculiarly accurate or good particular of its own kind, i.e. the standard particular of the kind in question or the model (παράδειγμα ) [i.e. paradigm ] to which other particulars approximate…. … Both in the Republic and in the Sophist there is a strong suggestion that correct thinking is following out the connexions between Forms. The model is mathematical thinking, e.g. 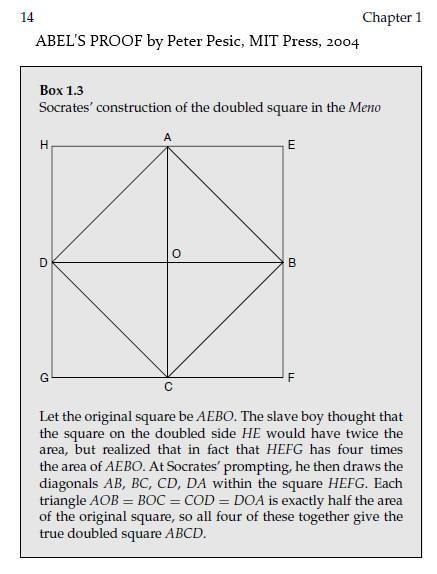 the proof given in the Meno that the square on the diagonal is double the original square in area." 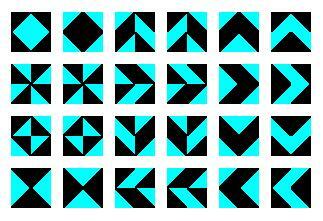 Each pattern has some ordinary or color-interchange symmetry. This is the 2×2 case of a more general result. The patterns become more interesting in the 4×4 case. For their relationship to finite geometry and finite fields, see the diamond theorem. Related material: Plato's Diamond by Oslo artist Josefine Lyche. — Closing words of the Algis Budrys novel Rogue Moon . Background— Some posts in this journal related to Abel or to random thoughts from his birthday.